Even though winter has arrived early in the north country, I got an extra taste of summer in Miami while there for the Reader's Favorite Book Awards. What a fun, exciting time we had. Going to the beach was top on my list of things to do and so was the Miami Book Fair where Rescue Me was among the books displayed. 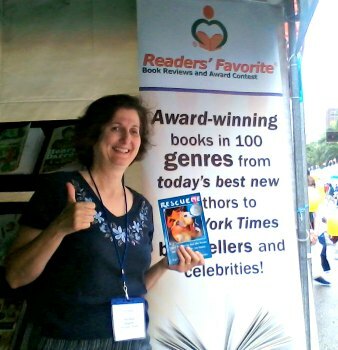 I met many talented authors and made what will hopefully be lasting friendships. "Illusion of an Ending is a wonderful story of our closest relationships with their ups and downs. It is a tale of love and loss and of connecting with loved ones in the here and hereafter…Through the characters' actions and interactions with each other, Danielle gently and accurately weaves the metaphysical concepts of life beyond physical death, our continued connection with loved ones on the Other Side, the Akashic Records, and embracing our life paths into the story. Whether you are already well-versed in these topics or are just curious, this novel and its pearls of wisdom will appeal to you. I thoroughly enjoyed this book." If you are struggling with the loss of a loved one or know someone who is, this easy reading story may bring you some comfort and healing. Each day of the book launch, December 17-19, is linked to one of three causes receiving donations from book sales. Learn more here. Have you ever noticed that despite your best intentions, the holidays often turn into times of distress and overwhelm? Instead of the happy times you envision bonding with friends and family over celebrations, cooking and gifting, it seems like the holidays just add more stress to your already busy life. There is extra shopping to deal with, relatives, decorating, cooking, and eating… in excess! This month’s challenge is an invitation to step back, relax, and connect with loved ones in meaningful, simpler ways. My wish for all of us this holiday season is that we will be filled with joy. Let the season bring “tidings of comfort and joy” and “peace on earth” starting within ourselves and in our homes. Read tips for a simpler holiday here. Good news for weight-lifters - Research shows that a 20-minute strength training session could improve memory and exercise can promote growth of new brain cells, enlarge your memory center, improve IQ scores, and help prevent brain deterioration associated with aging It's never to late to improve your brain health. Two other important factors-eat a healthy diet and get enough quality sleep. How important is our connection with nature? A recent study showed that men who spent only two minutes touching smooth plant leaves felt calmer and had less blood flow to the brain area associated with stress than men who touched metal or other materials. Wishing you happiness, healing, and blessed holiday season.